Recycling plastic waste is a complex issue to which no real solution has proven to be completely effective and environmentally responsible. Many recycling techniques have in fact proven to be rather expensive, energy inefficient, and as harmful to the environment, if not more, as plastic itself. The global population continues its exponential rise and economic and industrial activities thrive at an even faster rate. This has made the issue of recycling plastic waste, which accounts for a large portion of total waste generated on everyday basis from several sources, is becoming increasingly severe. Thus continuous research activities are being undertaken across the globe with an aim of finding an effective method of recycling plastic waste or gaining something beneficial from the process. According to the report, the global plastic recycling market will register a promising 6.9% CAGR over the period between 2016 and 2024, rising from a valuation of US$31.5 bn in 2015 to a revenue opportunity of US$56.8 bn by 2024. The report segments the global plastic recycling market based on criteria such as source, material, and application. Based on material, the market has been segmented into high-density polyethylene (HDPE), polypropylene (PP), polyethylene terephthalate (PET), low-density polyethylene (LDPE), polystyrene (PS), polyvinyl chloride (PVC), acrylonitrile butadiene styrene (ABS), nylon, and polycarbonate. 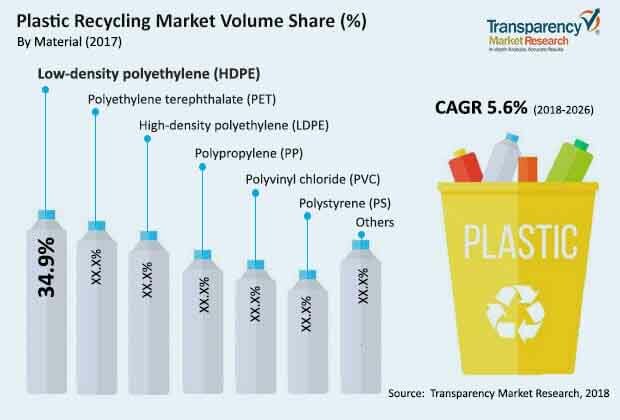 Owing to the rising global consumption of recycling PET and HDPE plastic products, these segments are likely to retain dominance in the overall market. Based on application, the market has been expanded into packaging, construction, automotive, textile, consumer goods, and industrial. Of these, the segment of packaging is expected to serve the most demand for recycled plastic owing to the thriving expansion of the packaging industry and the several mandates compelling the industry to adopt more environment-friendly processes and ways to cut-down on its carbon footprint. The construction segment is also increasingly becoming a notable consumer of recycled plastic and is likely to account for a notable share in the overall market by the end of the report’s forecast period. Based on geography, the report examines the plastic recycling market for regions such as Asia Pacific, North America, Europe, Latin America, and Middle East and Africa. The market in Asia Pacific is likely to account for the dominant share in the overall market, China expected to contribute to nearly 50% of the global market alone by the end of the forecast period. Asia Pacific is also the leading importer of recycled plastic scrap, with India also accounting for a notable share in the regional market. The region has well-established infrastructure for parings and converting plastic scrap into resins for using them further for a number of applications. Abundant labor pool and lenient regulations also bode well for the regional market. The market in Europe is also likely to exhibit a promising pace of expansion over the forecast period owing to the strict regulations regarding the reuse of recyclable plastics in the region. The region is presently recycling nearly 4.4 mn tons of plastic waste every year owing to the several regulations that put a ban on discarding plastic waste into landfills. Moreover, the rising awareness regarding the need to recycle for the protection of environment also works well for the regional market. The vendor landscape of the global plastic recycling market is highly fragmented and features a large number of unstructured, small players in the largely unorganized market in several emerging and underdeveloped economies across the globe. International companies seeking entry into these emerging economies, which possess vast growth opportunities due to rising populations and swelling use of plastic products for daily necessities, are focusing on ways of consolidating and organizing these markets through strategic collaboration. Some of the leading companies in the global plastic recycling market are KW plastics, Kuusakoski Oy, Envisison Plastics, and Plasgran Ltd. Plastic recycling is a process of collecting plastic scrap or waste and reprocessing it into useful products. It may also be defined as the process of cleaning, sorting, and processing pre-consumer or post-consumer plastic waste into resins for various applications. Plastic scrap can be rigid (bottles, containers, furniture, etc.) and non-rigid (films, wrappers, pliable sheets, etc.). Plastic is non-biodegradable; recycling plays an important role in reducing plastic in the waste stream. Based on material type, the plastic recycling market has been segmented into PET, PP, HDPE, LDPE, PS, PVC, and others. HDPE is a highly recycled plastic. It accounts for more than 30% share of the global plastic recycling market. HDPE is employed in various applications such as bottles, bottle caps, cable insulations, fuel tanks for automobiles, camera lenses, pipes, containers, storage sheds, and printing filaments. HDPE is also the most recycled polymer in the world, due to its high recyclability and strength. PET is largely recycled into PET fibers and yarns for textile applications. However, most plastics end up as construction products such as plastic lumber, landscaping furniture, and roof & floor tiles. Post-consumer polyethylene terephthalate (PET or PETE) containers are sorted into different colors. PET recyclers further wash and clean the flakes. The clean flake is dried, melted, reprocessed and then converted into useful products such as bottles, sheets, straps, monofilaments, master batches, injection molded articles, polyester staple fibers, and partially oriented yarns. rPET is widely used in the production of polyester fibers. Based on application, the plastic recycling market has been segmented into packaging, automotive, construction, textile, and others (industrial, consumer goods, etc.). Plastic packaging is usually carried out in two forms: rigid packaging and flexible packaging. Rigid packaging usually includes containers, rigid bottles, and boxes, while flexible packaging comprises plastic wraps, carrier bags, sachets, packets, and covers. The construction industry has been using plastics since decades, as they are light in weight and durable. The construction industry primarily employs plastics in pipes (especially PVC pipes), cable insulations, storage tanks, roofing and roof decks, windows and doors, guard rails, fences, floor tiles, and hardware accessories. In terms of region, the global plastic recycling market has been divided into North America, Europe, Asia Pacific, Latin America, and Middle East & Africa. In terms of demand, Asia Pacific was the leading region of the global plastic recycling market in 2017. Large scale production of plastic trash and availability of cheap labor are key factors driving the demand for recycled plastic in the region. The report analyzes and forecasts the market for plastic recycling at the global and regional levels. The market has been projected in terms of volume (kilo tons) and revenue (US$ Mn) from 2018 to 2026. The study includes drivers and restraints of the global plastic recycling market. It also covers the impact of these drivers and restraints on demand for plastic recycling during the forecast period. The report also highlights opportunities for expansion of the plastic recycling market at the global and regional levels. The report comprises detailed value chain analysis, which provides a comprehensive view of the global plastic recycling market. Porter’s Five Forces model for the plastic recycling market has also been included to help understand the competition landscape of the market. The study encompasses market attractiveness analysis, wherein application segments have been benchmarked based on their market value, growth rate, and general attractiveness. The study provides a decisive view of the global plastic recycling market by segmenting it in terms of material, application, and region. These segments have been analyzed based on present and future trends. Regional segmentation includes the current and forecast demand for recycled plastic in North America, Europe, Asia Pacific, Latin America, and Middle East & Africa. The report also covers individual application segments of the market in all the regions. The study includes profiles of major companies operating in the global plastic recycling market. Key players profiled in the report are Kuusakoski, B&B Plastics Inc., CarbonLite Industries LLC, Custom Polymers Inc., Dart Container Corporation, Fresh-Pak Corp, Novolex, KW Plastics, MBA Polymers UK Ltd., PLASgran Ltd., Plastipak Holdings, Inc., WM Recycle America LLC, and Wellpine Plastic. Market players have been profiled in terms of attributes such as company overview, business strategies, recent developments, and SWOT analysis. The report provides the estimated market value of the global plastic recycling market for 2018 and forecast for the next eight years. Market numbers have been estimated based on material, application, and region. Market value and forecast for each material type and application segment have been provided for global and regional markets.